Today, I got me some beautiful neck and shoulder of this Colorado lamb. 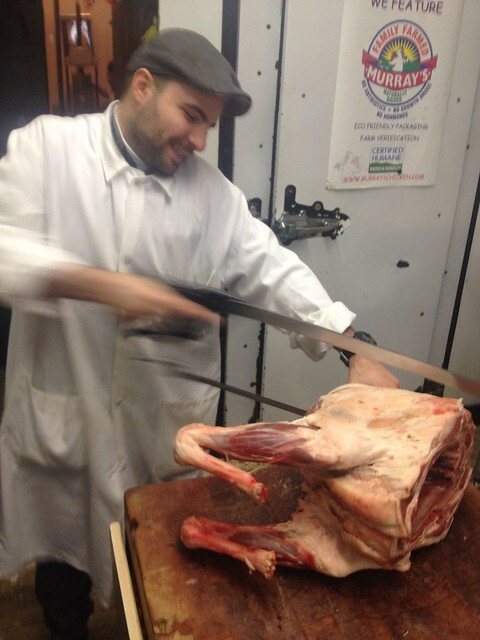 Pino has been carving up sheep, pigs and cattle since he was a teenager in the Sicilian town of Castrofilippo, and you might say that meat is in his blood. When I asked him about his family, this was his answer: "My grandfather was a butcher. My father was a butcher. My brothers are butchers. My brother-in-law. My sister-in-law. My nephew and my other nephew—butchers. My son is a butcher." One of the first places we noticed when we were scoping out Inwood, before we decided to move here, was Broadyke Meat Market, on Broadway just above Dyckman Street. The butcher there (sorry, don't know his name) has had the place for something like forty years. He's got an assistant who mostly takes care of deli orders and defers to him as The Butcher when I ask for meat. I've bought steaks there, lamb chops (and will be getting a leg later today), pork chops. Is it the absolute best meat on earth? Who cares? It's all very good. 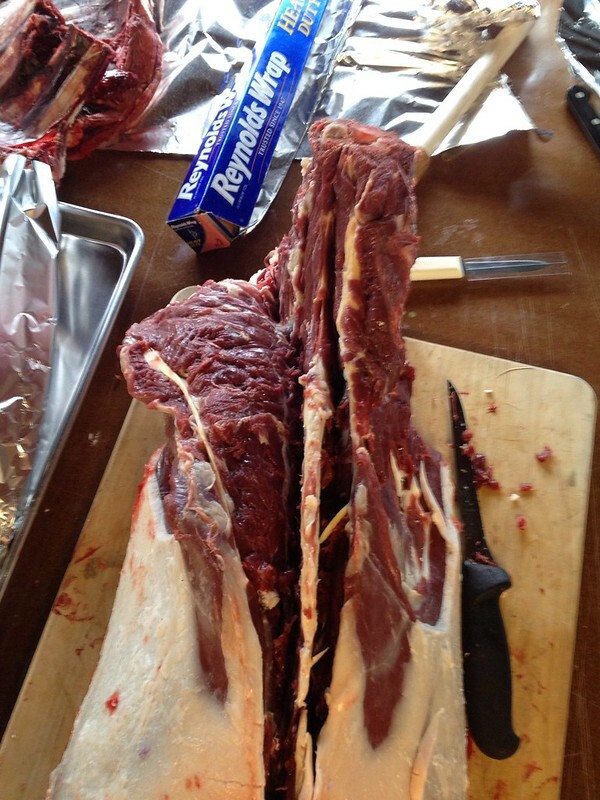 The steaks have been sufficiently marbled that they are very tender; the lamb and pork are very flavorful. Prices are very reasonable--I think I paid something like $8 a pound for loin lamb chops--and best of all, he weighs to price the meat AFTER he trims it. Pino's is the best. I have been a customer for many years. I also like Florence Meat Market on Jones. What I want to know is what's that clam or oyster knife doing on the worktop? Maybe he gonna stuff it with oysters. People talk to me. We moved to Stuytown a month ago after our aborted attempts at Brooklyn. Where is there a decent butcher within reasonable proximity to 1st and 23rd? Fishmonger? There used to be a French butcher on Second Avenue, not far from where you are. Lovely Art Moderne building with colored tiles, iirc. I remember seeing it from the bus. Of course, I haven't been that way in 21 years, so it could be gone. And you're not that far from Eataly, by crosstown bus. But you knew that. Eataly is my nearest best Option. Alas the french butcher has closed. The French Butcher closed many years ago, but was replaced by Gramercy Meat Market (which is still there), and the adjacent fish monger which opened at the same time as the French Butcher now goes under the name Rosendo. Since I moved out of that neighborhood about fifteen years ago, I can't vouch for either, but at least they exist. I can't think of any other specialist fishmonger in the neighborhood, but you have East Village Meat Market, and possibly another Ukrainian or Polish butcher on First Avenue. I don't want to live in a world where Bonner can't move to Brooklyn. Such is life. Apparently Rosendo has fish and meat, if it's still there. But honestly, why should it be better or worse than Whole Foods? Yeah, Kips Bay Whole foods. Union Square Greenmarket for fish. The Kips Bay Fairway is an abomination. I will check out piscane. That's kind of convenient for me.